Alright. Here's what all 3 of you have been waiting for: the footage. I've uploaded an image to show the full resolution of the footage that we shot along with a nice, low res video to show the camera move. Hopefully I'll have a camera track of this in the next few days, as time permits. The start of the camera move lingers on the ground for about 8 seconds before booming up to show the full reveal. 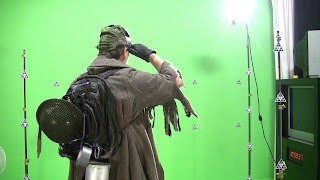 This is to have something as we do a synthetic camera move rushing along the ground before seeing our post-apocalyptic-Tom standing on the edge of a cliff. Our key light was placed for some strong rim light from a low sun. In the next week or so I'll head out to Garbage hill to shoot an HDRI of the setting sun and comp that in. This is going to be so much better than Terminator Salvation. If it's at least internally consistent, it will be MILES better than Terminator Salvation.